The New York Times has always had a reputation for viewing the world through some very expensively tinted spectacles. Even in happier economic times it seemed to have a curious perspective on what constituted financial hardship, like in this article about Silicon Valley millionaires who don't feel rich enough because their neighbours own even bigger houses or drive better Ferraris. However, the credit crunch seems to be casting the old grey lady even further adrift from ordinary people's concerns. This week alone has seen not one but two brilliantly badly judged tales of monetary suffering. First there was this excellent piece by Frank Bruni on how tough it is in New York to feed two people for under $100 (or around two days' pay on minimum wage). Then today we have this treat focusing on the teenage offspring of formerly wealthy parents who are having to struggle by without such basic necessities as pilates classes and sushi lunches. Breaks your heart, doesn't it? And all this just weeks before Christmas too. It almost makes you forget about people losing their savings, jobs, and homes. The man [Gladwell] has a 6,300 word disclosure statement on his website. All it needs is: "I've got nothing to say, move along." One thing the internet isn't short of is "product review" websites. Unfortunately, the vast majority of these are really just ads for retailers, while the rest are generally vapid and ill-informed. Even those offered by seemingly reputable sources, such as big-name newspapers or magazines, are often just regurgitated press releases. Thankfully, with a bit of digging around you can find a few that offer intelligent analysis from people who use and understand the products they are writing. Some even have enough perspective to put forward the odd negative point of view. For example, I've been thinking recently about investing in either an iPhone or a more compact laptop, as my regular MacBook is a bit too heavy (and valuable) for me to carry with me all the time. Then I read this excellent article on The Register comparing netbooks and smartphones, which put me firmly in my place. Am I a misguided geek who wants to waste a few hundred dollars on "a cheap, underpowered laptop", or am I a member of the "busy San Francisco digerati who needs constant access to the web to watch Facebook friend connections and Twitters his every vapid thought" via an iPhone? Hmm. You know, I could always just buy a pad of paper and a couple of pens. Right now I'm re-reading Don DeLillo's novel White Noise, and feeling slightly disappointed. When I read it the first time a little over ten years ago, I was dazzled by its daring comic grotesques, but now the dread of modern life and apocalyptic "airborne toxic events" seem very dated. Members of an air-crash cult will hijack a jumbo jet and crash it into the White House in an act of blind devotion to their mysterious and reclusive leader, known only as Uncle Bob. Of course, DeLillo wasn't alone in predicting such a thing, but it was still strange to see what was once a ludicrously far-fetched joke transformed by the passage of time into a sad piece of history. However, the best part of 20 years had passed between DeLillo writing the passage in the early 1980s and the attack on the World Trade Center in 2001, which seems like a reasonable interval between comedy and tragedy. The gap between reality and satire seems much smaller now, and it's increasingly hard to make comedy that is funnier or more extreme than what we see actually happening. I'm thinking of the fact that in 2003, Arnold Schwarzeneggger managed to release Terminator 3 and be elected Governer of California in the space of just three months. Or the way that it's often hard to tell the fake Bushisms from the real ones. It's not just in politics. Guardian columnist Charlie Brooker stopped writing his brilliantly caustic spoof listings magazine TV Go Home because he was finding it increasingly hard to top the ridiculousness of reality TV -- which is perhaps no surprise considering he started writing it in 1999, the same year a UK garden makeover show travelled to South Africa to transform Nelson Mandela's herbaceous borders. And, with the recent US election, satire was cast aside almost completely as the news itself became comedy. A trend started by the likes of the Daily Show reached its natural conclusion when Tina Fey won near-universal praise for her comic portrayal of Sarah Palin in a Saturday Night Live sketch which quoted the vice-presidential candidate verbatim. Now the election is over, hopes are high that the incoming administration is going to have a positive effect on many aspects of life, both here in the US and further afield. However, I'm not sure that the appointment of a black man named Barack Hussein Obama as president is going to do much to help the struggling world of satire. This strange dance between election night reality and reporting is a subject I'll return to. November is National Novel Writing Month, an annual event which encourages participants to write a 50,000 novel in just 30 days. I took part for the first time last year, and to my surprise actually reached the end with 50,000 words. I hesitate to call what I ended up with a novel though, or even a rough first draft. It was condemned by several fatal flaws. First, I attempted to write a thriller by mistake. I didn't start out intending to, it just turned into one. It turns out that it's very hard to write a successful thriller by accident. Thrillers take careful planning. Mine was an unplanned disaster. Second, my writing kept slipping into a smart-arsed style that relied on a lot of slightly painful jokes. This was one of things I had always feared would happen if I ever attempted to write a novel. It wasn't pretty, and was made doubly frustrating by the parts where this didn't happen. Why couldn't I write like that all the time? And, third, I never actually finished the damn thing. Sure, I wrote 50,000 words, but I reached that total without even getting close to an ending. This was mostly because, by that point, the plot made absolutely no sense and had pretty much collapsed in on itself due to the unbearable weight of its own contradictions. So what could I do with it? In the words of Zoot, "If I had a match, I could put it out of its misery." So this November I signed up to do it all again, resolving to learn from my mistakes. But I quickly discovered that it's pretty much impossible to write at such a furious pace while also working for a living (this time last year I was still enjoying the last few weeks of my immigration-enforced unemployment). No, actually, I'll correct that. It's possible to write at that pace, the question is whether you can write anything worth reading. And I clearly can't. Both NaNoWriMo and its founder Chris Baty's "how to write a book" book No Plot? No Problem! are excellent exercises in encouragement, especially in the way that both drive home the central point that first drafts aren't supposed to be the finished article: indeed, they're supposed to be rubbish. But what I've discovered is that there is rubbish, and there is irredeemable crap that no amount of turd-polishing will help become anything other than shinier shite. Forcing yourself to write more than 1,500 words a day, every day, is a good way to produce a high word count, but that means writing when you aren't in the right mood, when you don't have fully formed ideas in your head, when you're tired, when you'd really rather be doing anything else. Sometimes the results will surprise you, but not often enough to make it worthwhile for me. So I've abandoned my November novelling ambitions. Instead I'm planning to write at my own pace, rejecting Chris Baty's high-octane approach in favour of following my friend Alison's more elegant advice. "Writing a book is simple," she says. "You just start writing, keep writing, and don't stop until you finish." I'm officially in love with fivethirtyeight.com, the presidential election website run by baseball statistician Nate Silver. Operating under the tagline "political polling done right," he has applied a fantasy sports enthusiast's love of number-crunching to the upcoming ballot, examining the various polls and statistics, and arriving at some interesting conclusions. In particular, his thoughtful, intelligent analysis of why the various polls are wrong (and let's not forget that to a greater or lesser degree they are all wrong) makes you wonder why we pay attention to any of them in the first place. For example, there's the simple fact that most modern polling companies don't call cell phone numbers, despite the increasing numbers of voters who don't have a landline. Even better, the site is about much more than mere stats, and includes some excellent on-the-ground first-person reports from campaign battlegrounds around the country. Because these stories aren't the site's main feature (and because this isn't a traditional news website), they tend to be more anecdotal, subjective, and, frankly, interesting than much of the coverage coming out of the traditional news media that I've seen. Just read this provocative story about a racist couple who say they are voting for Obama if you don't believe me. I hate Microsoft Word. It is fussy and irritating, and too often tries to do "helpful" things you don't want it to - unless you spend ages working out how to turn off all of its irritating automated functionality. Also, as a Mac user, it is the most unstable piece of software I use on a regular basis, and has been over many years and updates. So thank god for Hog Bay Software's WriteRoom text editor. 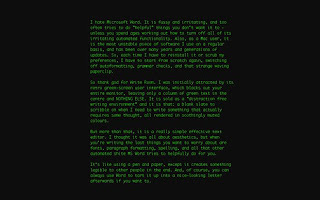 I was initially attracted by its retro green-screen user interface, which blacks out your entire monitor, leaving only a column of green text in the centre and NOTHING ELSE. Bliss! It is sold as a "distraction free writing" environment and it is that: a blank slate to scribble on when you need to write something that actually requires some thought, all rendered in soothingly muted colours. But more than that, it is a really simple and effective text editor. I thought it was all about aesthetics, but when you're writing the last things you want to worry about are fonts, paragraph formatting, spelling, tiresome talking paperclips and all that other automated shite MS Word tries to force on you. It's what a word processor should be: like a typewriter with a screen, or like a pen and paper that creates something legible. And, of course, you can always use Word to tart it up into a nice-looking letter or formatted document afterwards if you want to. I love the random celebrities who show up on Sesame Street, but I never thought Philip Glass would have been among them until now. Further to the aforementioned Raw Shark Texts, I've been reading a bit about the clever marketing campaign behind the book (so clever that I completely missed it, but kind of clever regardless). It includes a whole bunch of YouTube videos supposedly posted by the book's main character, and they reminded me in turn of this article Andrew pointed me towards a while ago, which looked at the online world created around the TV show Lost. As both of you know I'm reading Greil Marcus' Lipstick Traces now. I'm only half way through, it's slow going, occasionally jarring frequently laborious but you never know when something will grab you. I soldier on because those bits are too valuable, maybe just because I haven't read anything like this in years but probably because it has deep resonance with my analytical biases. Oh, and it reminded me of something that a fellow student stood up and asked in class back in college. Next post I'll attempt to describe this fascination instead of just talking about how it makes me feel.